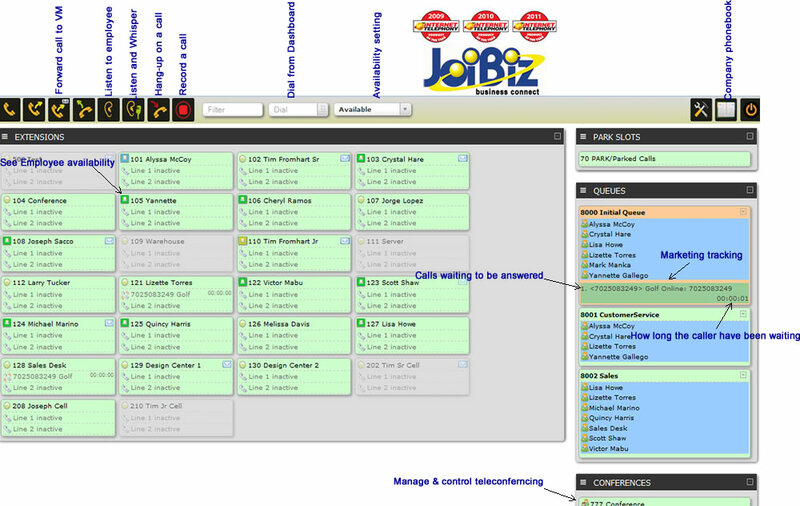 JoiBiz Dashboard was developed with a receptionists in mind. All actions are available within two clicks of the mouse. Presence: See who is available or not. Transfer: Transfer a call directly to destination extension, voicemail or external numbers. Call Pickup: Ability to pickup ringing phones. Parked Cal: Manage and visualize parked calls. Search: Real time search and filter of extensions (great for big companies with hundreds of extensions). Phone Book: Phone book with photo. Incoming Call Popup: See the name and photo of the caller on your screen. Manage JoiBiz Conference: Lock, invite, kick & mute (person or all), talk detection. Queue Display: See which agents logged into a queue. See every call waiting on the queue with its timer. Agents Status: See agent status Paused, Logged off, Do-Not-Disturb, Out for lunch etc. Manage agents: Add, remove or pause queue agents. Agent Monitor: Spy or whisper to agents.